We all want children to be happy and grow into productive, fulfilled adults, and according to parenting expert Maureen Healy, the secret to that success is in providing a foundation of inner confidence. With twenty years of experience as a spiritual teacher and child development expert, Healy knows that confidence is never "out there" but is something to be cultivated from inside.Healy literally traveled the world in search of the best practices in raising inwardly strong children and the connection between inner confidence and lasting happiness. In Growing Happy Kids, she draws on her Buddhist training, her background in child psychology, and the latest scientific research. The result is her insightful model for creating inner confidence and cultivating a sense of emotional strength that lays the foundation for children's happiest lives.Anyone who touches the life of a child--parents, teachers, school administrators, grandparents, clinicians--will gain wise ideas and practical suggestions for nurturing a child's sense of confidence and ultimately, happiness. During my time in Asia, I promised myself that I would get to the bottom of what confidence really is and how I can help others develop it—specifically, how I could help parents spark it in their children. Over the next few years, I pored through tons of clinical data and spoke with countless experts about confidence and self-esteem. Stacks of dense data fill my office. Through translators, I conducted interviews in English, Spanish, German, French, and Tibetan. My goal was to leave no stone unturned. After many more years of private practice with kids and parents along with studying inner confidence across different disciplines, I discovered that inner confidence manifests as a result of five building blocks. In this book, I share these 'Five Building Blocks of Confidence,' so raising confident kids is no longer an elusive topic but something real and possible for every parent—no matter his or her situation. Cultivating confidence cuts across all cultures, and the book in your hands is a result of my international path. I have been fortunate to travel to South Asia, the banks of London, the mountains of Mexico, and across cities in the United States speaking with parents, teaching classes, and working directly with children. One thing that also emerged clearly after interviewing hundreds of parents and kids: The path towards cultivating this deeper sense of strength isn't as mysterious as many of us might think. It simply results from doing things in a certain way—and that way is made clear in the Building Blocks and throughout this book. The development of inner confidence is also a prerequisite for so many positive experiences that it is essential for you to understand what it is and how to bring it to life through the Building Blocks. Growing Happy Kids is divided into three sections. In Part One, we'll define and understand the different types of confidence. I'll share the concept of outer and inner confidence along with the stages of confidence, especially as they relate to children. You'll read real-life stories to solidify your new understanding of confidence as a parent, and spend a little time in honest self-reflection. The definition of inner confidence—a deeper and more lasting type of inner strength—will become perfectly clear. And you'll hear from parents around the planet who are nurturing this deeper type of lasting strength. • The Five Building Blocks of Confidence—A new model to understand and develop confidence in children. The Blocks are: Biology, Beliefs, Emotions, Social, and Spiritual. • Implementing the Blocks—Each Block is explained in a down-to-earth format and includes practical ideas to implement each one. • The Confidence-Happiness Connection—Inner confidence is a prerequisite for lasting happiness. Each of these chapters offers new ideas, real-life stories, and suggestions to make your busy parenting life easier. The goal isn't to give you more to do, but to make your time with your child as effective as possible. If you want to raise a child to be confident from the inside out, this book will help you accomplish that goal. Today, we want our children to become strong from the inside out and lead their happiest lives. This all begins with the creation of inner confidence. In Part Three, we'll explore what to do when confidence breaks and how outer confidence alone always leads to disappointment. You'll be given 'warning signs' of wobbly confidence and practical suggestions for course-correcting your child's sense of confidence. You'll learn how to guide a child to let go of negative thoughts and move beyond any mental limitations to begin seeing himself or herself as the incredibly strong person he or she is inside. Finally, I'll offer practical resources that you can refer to repeatedly. Each exercise is provided to spark your own sense of play and purpose as you cultivate your child's inner confidence. Inner confidence doesn't happen overnight. The path to this deeper level of strength and poise occurs over many days, weeks, and years. Since you'll be living on Planet Earth anyway, these moments might as well mean something; make the ones you spend with your child valuable, so when you are no longer here, your son or daughter will still have the greatest gift you could ever offer: a sense of inner strength that he or she can harness to create their happiest lives. My path to this deeper level of confidence is still unfolding. I'm both a teacher and a student, but I have come to a place of inner confidence—I truly know that no matter what happens in the outer world, my inner self is strong and can persevere. I am no longer plagued by feelings of insecurity, doubt, and a sense of uncertainty. Implementing the ideas in this book immediately pointed me in the right direction and transformed my life as well as my clients' lives. I am living proof that these Building Blocks of Confidence work! It is my wish that this book empowers you and gives you the strength you need to cultivate inner confidence in yourself and your children—so all of you can feel a greater sense of inner peace and live your happiest lives. Maureen Healy is a child development and parenting expert with twenty years of experience fostering children's holistic health. Her organization, Growing Happy Kids, is committed to planting the seeds of strength and inner peace in children globally. With both experience in private practice and as a public advocate for children, Maureen has helped countless parents, teachers, and children develop the skill of self-confidence and learn how to cause happiness. Unique about Maureen is that she has spent a significant portion of her life studying Eastern and Western psychologies focused upon how to be happier. She has studied in Asia with His Holiness the 14th Dalai Lama, worked with Tibetan children in India, and has continued to be a student of Tibetan Buddhism with her root lama in the United States. Complimenting her eastern mindset, Maureen also delved deeply into the western science of happiness through studying child clinical psychology and working with some of the "great" thinkers of our time. With such an insightful and rare perspective, Maureen has become a leading voice in the field of parenting and children's emotional health. She writes a popular blog on Psychology Today's website titled "Creative Development" and has also appeared on ABC's View from the Bay, CW's San Diego Living, and NBC's Philadelphia 10! Her writing has appeared in Spirituality & Health, Tathaastu, and Counselor Magazine as well as notable websites like PBS's This Emotional Life series. She is also a sought after speaker for educational conferences, international events, and parenting programs across the nation. 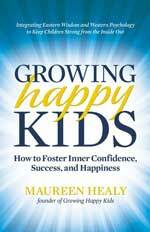 Healy's intuitive insights and scientific understanding of children is grounded in her background. She studied psychology at Clark University in Worcester, Massachusetts where she received a BA and also an MBA focused on human potential. She then studied at Fielding Graduate University based in Santa Barbara, California, where she focused on child clinical psychology and completed two years of doctoral training. Combining these educational experiences with practical understanding, Maureen is committed to being a force for good on behalf of children everywhere. For more information, please visit www.growinghappykids.com.